I have been surprised this year by the number of Devonport residents I have spoken to who are considering downsizing or maybe we should call it re-sizing. People for whom the family home is just becoming too large and unwieldy, and who sense they need to make a change. I've been delighted to work with them to find that next home. With this in mind I was delighted to be asked by Susan Templeton to join her and a couple of her colleagues to contribute to forthcoming event on just this subject in a couple of weeks. Susan runs these very informal gatherings every month at the Devonport Library and invites a small group of people to come together and hear the views and opinions from specialists and to share experiences and pose those key questions. If this sounds of interest to you - please grab a ticket today (it's free! but spaces are limited) and I look forward to seeing you there on the 18th September. Do Devonport house sales prices double every 10 years & quadruple every 20 years? I recently undertook an analysis of historical NZ and Auckland house prices going back to 1992 to answer an age-old question at to whether property prices double every 10 years? I've heard the anecdote used widely and often as a forward looking statement as to the prospect for the next 10 years. A well understood fact that I have always applied when hearing such a statement, is that the past is not always the best indicator of the future, and so it can be with regard to property prices. Anyway I was interested to put this question to the test and wrote an article on my Properazzi site to demonstrate the results. What was interesting, was that no sooner had I posted that article, a comment was made to ask if the same form of analysis had been undertaken to test the question that property prices quadruple every 20 year period? A brief mathematics lesson if school and university were many years ago - when compound interest is applied to a sum of money that growth can have a significant multiplier effect. A 7.2% annual rate of growth applied to the sum of $100 will see that sum rise to $200 in 10 years with that steady 7.2% annual rate of growth. Continue that rate of growth consistently for another 10 years and that original $100 will be worth $400, a 300% increase in 20 years - a quadrupling. 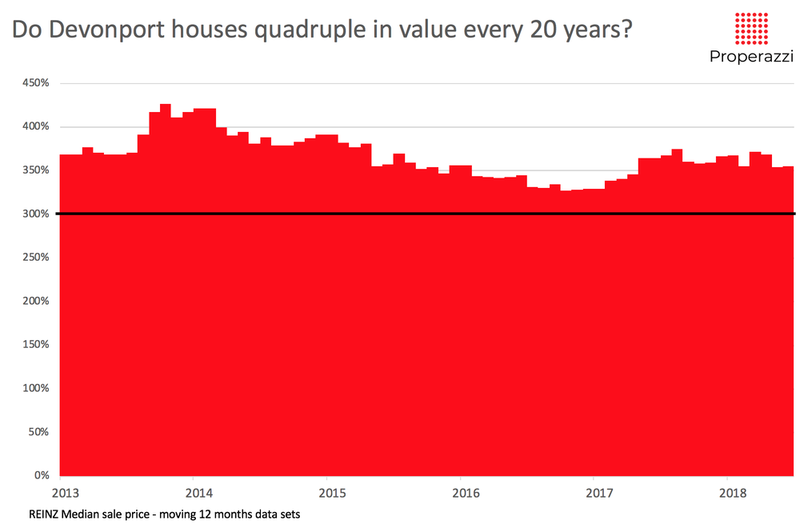 So back to the title of the post - Have Devonport houses doubled in each of the past 10 year periods and quadrupled in 20 year periods? I have chosen to use data for Devonport houses and deliberately exclude all units, apartments and townhouses as these market segments are small and may impact the data. I have also used 12 month moving sales data rather than median price in a single month as a small market can experience month-on-month volatility. That said the answer is a resounding YES, in the case of 20 year quadrupling a resounding yes, and in the case of 10 year doubling, pretty much yes. Here are the visual demonstration with each red bar representing a period of data compared to the same period 10 or 20 years ago. The black horizontal line is the benchmark for doubling or quadrupling in each case. So in regard to the quadrupling every 20 years - consistently every 20 year period starting in 2013 when comparing any month with the same month 20 years previously the growth has been well over 300% - a quadrupling. In fact the average 20 year growth is 367%. As an example the median house sales price in Devonport in January 1993 was $220,000 based on the total sales of houses in the 12 months to Jan 1993. That median sales price had rise to $1,030,000 by January 2013, a rise of 368%. Turning to look at the 10 year chart, it shows that in the period between 2003 and 2013 house prices in Devonport had doubled during the preceding 10 year period, however subsequently that growth has hovered around the threshold of doubling. The latest data for the full 12 months to June 2018, house sales price have more than doubled when compared to June 2008. By way of comparison below are the same 2 charts for the wider Auckland region showing the 20 year and 10 year growth in house prices. The data set is identical to the Devonport data - just house sales (excluding apartments, townhouses and units) and a 12 month rolling sale prices. This comparison would seem to show that Devonport outperforms the wider Auckland region over the 10 year period and most certainly over the longer 20 year period, this latter by quite a significant margin. 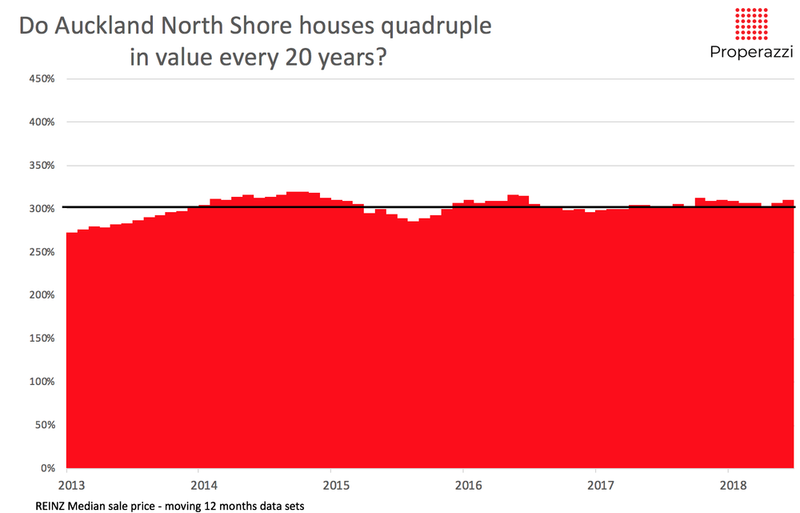 Finally comparing Devonport to the whole of the North Shore showing below the 20 year and 10 year growth in house prices. The data set again is identical to the Devonport data - just house sales (excluding apartments, townhouses and units) and a 12 month rolling sale prices. These charts which are similar to the Auckland region further demonstrating the appreciation of property prices in Devonport compared to the wider market. The next evening event hosted by Devonport Heritage will be held on Thursday the 30th August at the Devonport Yacht Club from 7.30pm. The evening will comprise a talk on the lesson learned from a Heritage perspective in the way the volcanic domains at Mt Roskill and Puketapapa have been handled and a presentation on the history of the streets of Domian and Burgess Road and area of long heritage as one of the early development areas of Devonport. Come along and join us (I am a committee member), entry is free, we do though ask for a koha as a means of supporting this voluntary organisation. I believe that people make better decisions especially when it comes to property when they are better informed. With this in mind who better to invite to share his thoughts as to property market trends than Bernard Hickey. Bernard is a financial commentator who keeps a close eye on the economic and political drivers for housing. He regularly appears on television and radio to analyse the outlook for supply and demand for housing, including for the key markets in Auckland. Thanks to all of those who came along to listen to Bernard's presentation @ The Vic. It was a highly enjoyable time and I believe of great value to better appreciate the key analytics that drive Bernard's thinking that we are living in times which bode well for NZ. For those who are interested, here is the full slide deck from the evening, including some more slides that Bernard did not have time to go through as well as a video I made. Apologies for the low volume at the start of the video as I make my opening remarks, as you get into Bernard's session the sound is higher. I am a member of Devonport Heritage and am very pleased to contribute in this way to the preservation of our local heritage. Key to the role of this voluntary organisation, is building awareness of what is going on in our area with regard to the heritage of our built environment. Quarterly we put on a presentation evening. The next one is to be held on Thursday 5th April at the Yacht Club on King Edward Parade. It's open to everyone and entry is free with a Koha opportunity. Here are the details; of personal interest is the presentation I am doing on 'our street' - Buchanan Street.